We live in a world troubled by inequity and contradiction. Witness the subject of human rights: on one hand, international bodies and individual governments have outlawed a range of inhumane practices and passed laws intended to ensure fair treatment for all. On the other hand, for many of the world’s 6.5 billion human beings, life continues to be a painful struggle for existence against injustice and abuse. Amnesty International, in its Report 2003, pinpoints major human rights violations in 151 countries. Is there a factor which, if addressed, would remedy these injustices? Members of Scientology churches worldwide have, since the earliest days of the religion, assumed the mantle of responsibility for reversing this climate of conflict. With the view that a threat to the freedom of any one individual is a threat to the freedoms of all, many Scientologists have stepped forward as volunteers to protect not only their own fundamental rights, but also those of all cultures, colors and creeds. Since 1997, they have carried out this mission under the banner of the International Foundation for Human Rights and Tolerance28, a non-profit association based in Los Angeles. Its purpose: to promote human rights and tolerance while greatly increasing awarenessand enforcementof what it terms “the Magna Carta for all humanity": the United Nations Universal Declaration of Human Rights. The vital importance of human rights in preventing war and promoting goodwill among nations, races and religions is the central reason the UN adopted the Universal Declaration of Human Rights (UDHR) in 1948. 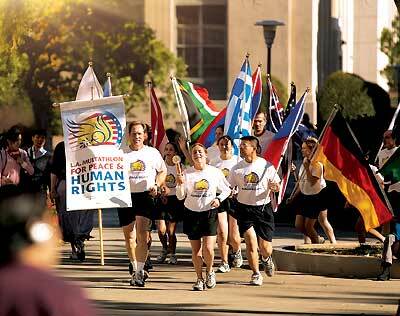 Believing, therefore, that greater awareness of the UDHR will lead to greater exercise of its principles, churches of Scientology have for many years made human rights education a priority. Left: The International Children’s Choir joins the Foundation for Human Rights and Tolerance to inaugurate the now-annual Los Angeles Multathlon for Human Rights. Right: Actress Kirstie Alley and actor/entertainer Isaac Hayes (center and right) have fought alongside leaders of religious and human rights organizations to win important victories for religious freedom and human rights. The Foundation for Human Rights and Tolerance, often working in partnership with the Human Rights Department of the Church of Scientology International, has organized human rights events to promote the Declaration to millions in the United States and abroad. In 1998, this collaboration proved successful when participants from all over the continent joined the European Journey for Religious Freedom, running 3,225 kilometers through Britain, Holland, Belgium, France, Switzerland, Italy, Austria and Germany to raise public awareness of the UDHR in its 50th anniversary year. Meeting thousands of people, from government officials, to human rights and church leaders, to the public at large, the marathoners acquainted themmost for the first timewith the details of this fundamental human rights charter. Taking into account the literature they distributed and the numerous television and radio programs in which they appeared, the marathon team brought the UDHR to an estimated 30 million people. The Journey was succeeded the following year by an even more ambitious human rights marathon, which started in the historic birthplace of democracy, Athens, and ended 13 weeks later in Hamburg. In subsequent years, these human rights marathons have crossed Belgium, Hungary, Czech Republic, Austria, Germany, Switzerland, Spain, Italy and France. In 2002, the European marathon expanded to become a “Multathlon,” a coined word meaning “many contests” in the sense that participants run, walk, cycle, sail, ride, swim, in-line skate or engage in any sporting activity for the cause. The first multathlon began in St. Petersburg, Russia, with a free concert to promote human rights attended by an audience of 12,000. That same year, the Foundation launched its first U.S. human rights multathlon in Southern California, a five-day run that criss-crossed dozens of ethnic communities and helped to bring the area’s diverse cultures and peoples together. The Los Angeles City Council recognized the value of this project in a proclamation that commended the Scientologists and the United Nations Association USA (UNA-USA)29 for jointly sponsoring the event. This event was so popular that not only was a second multathlon held in December 2003 to commemorate the UDHR’s 55th anniversary, but multathlons are now being scheduled across the world in Ukraine, Hungary, Russia and Mexico, as well. © 2003-2008 Church of Scientology International. All Rights Reserved. For Trademark Information on Scientology Services.